Thank you, Three Bridges, for sponsoring today’s recipe. As always, all opinions are my own. Did you know that October is National Pasta Month? 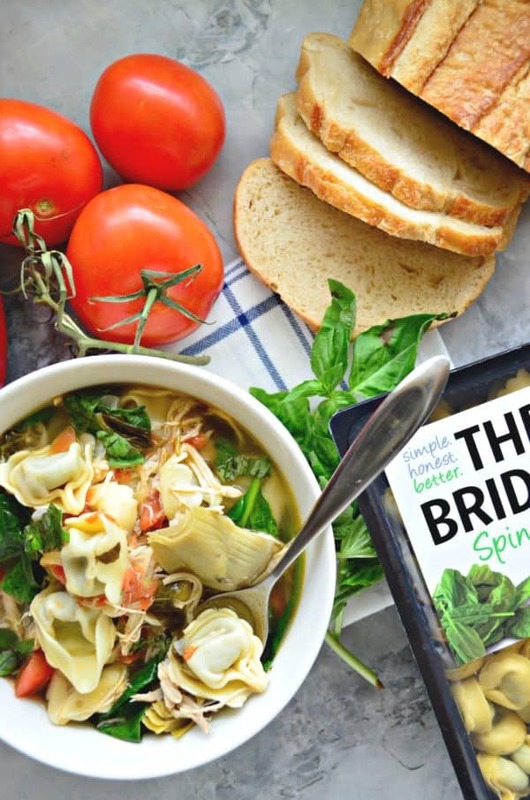 We’ve partnered with Three Bridges – makers of premium refrigerated pastas and sauces that are simple, honest and better for you – to create deliciously quick and easy recipes for fall. I love a hearty soup on a crisp cool day, especially one that is made in 15 minutes time! 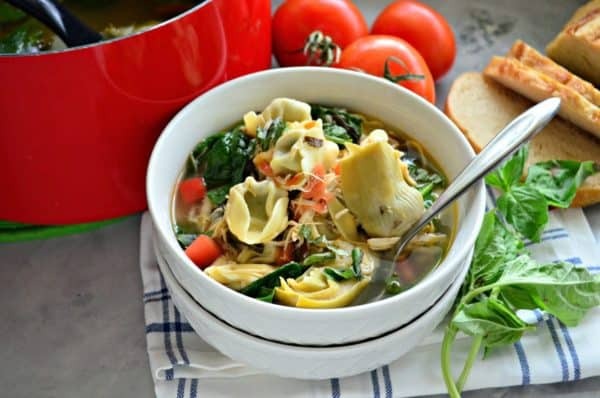 Since today is #TortelliniTuesday (move over Taco Tuesday), I’ve decided to create a Lemon Artichoke Chicken Tortellini Soup. I’m always looking for a quick and easy dinner (or lunch) and this soup is the perfect fall meal. 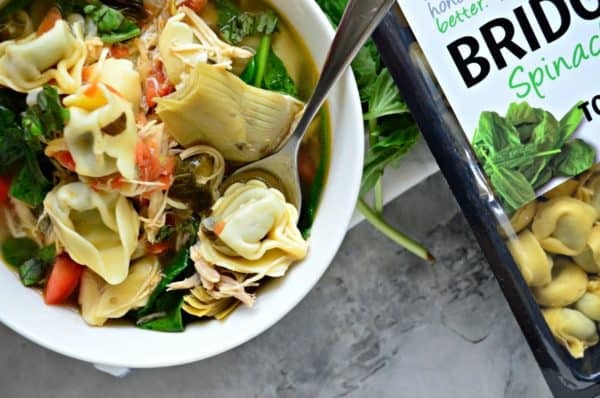 I love using Three Bridges fresh tortellini in my soups. They deliver what people enjoy the most about food – real, quality ingredients and incredible taste – without the guilt or fuss. I can feel confident opening up a package and knowing I’m serving my family the best. Three Bridges foods are available at natural food and grocery retailers nationwide including Safeway, Raley’s, Target and more. Three Bridges’ deliciously accessible and easy-to- prepare pastas and sauces are always made from premium natural ingredients, like rBST-free cheeses, nutrient-dense spinach and kale, and heirloom tomatoes. Three Bridges products contain no artificial ingredients, preservatives, fillers or hormones. Let’s talk about how easy it is to make this soup. You’ll start by sweating the onions and garlic in a large stockpot or French oven. Then add in some fresh lemon zest, lemon juice and white wine. The perfect trifecta to deglaze the soup pot and bring out all the flavors. Then add the chicken stock to the pot and bring to a rolling boil. Once the stock is bubbling it’s time to reduce the heat and add in the Three Bridges Spinach and Cheese Tortellini, fresh tomatoes, spinach and shredded chicken. I let the soup simmer for a few minutes and then divide evenly among three bowls. I love to top the soup off with fresh basil. Pro tip: if you like to make the thin basil threads, here is how you do it: Lay the basil leaves flat on top of each other. Then roll tightly, and thinly slice. That’s it! Now you know the secret to how easy it is to do. 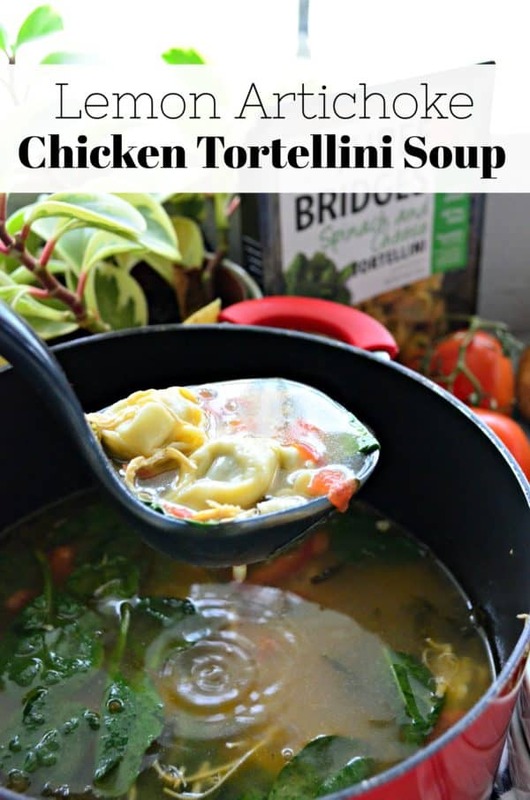 If you’re looking for a delicious and easy dinner, then give my recipe for Lemon Artichoke Chicken Tortellini Soup a try. I pair this with a good crusty bread and the meal is ready in minutes. You can make your own (ahead of time, since the soup only takes minutes) or buy a store-bought bread. You can even find premade breads in the store now that just need to be reheated in the oven. You can fool your family by placing it in the oven while the soup simmers. They will truly think you’re a miracle worker and an extra win for you—you get to reap the reward of fresh bread and a hearty tortellini soup. Three Bridges wants to give one lucky reader a wide-variety of their products. Just enter in the widget below for a chance to win. One winner will be chosen at random. Must reside in the United States. I love all of the flavors in this soup! Totally pinning to make when we get our little cold snap in Tampa! Perfect for our chilly weather today! I made this for my husband’s dinner tonight and he LOVED it – slurped up everything!! Thanks for the recipe!! Michele–so happy to read this! Glad you guys enjoyed it!